“Toyota Genuine Motor Oil” is used in your Toyota vehicle. Use Toyota approved “Toyota Genuine Motor Oil” or equivalent to satisfy the following grade and viscosity. SAE 0W-20 is the best choice for good fuel economy and good starting in cold weather. If SAE 0W-20 is not available, SAE 5W-20 oil may be used. However, it must be replaced with SAE 0W-20 at the next oil change. 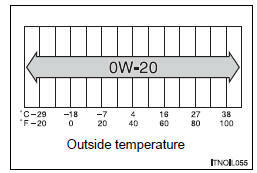 • The 0W in 0W-20 indicates the characteristic of the oil which allows cold startability. Oils with a lower value before the W allow for easier starting of the engine in cold weather. • The 20 in 0W-20 indicates the viscosity characteristic of the oil when the oil is at high temperature. An oil with a higher viscosity (one with a higher value) may be better suited if the vehicle is operated at high speeds, or under extreme load conditions. The ILSAC (International Lubricant Standardization and Approval Committee) Certification Mark is added to some oil containers to help you select the oil you should use.